Texans celebrate history with — what else? — fashion! 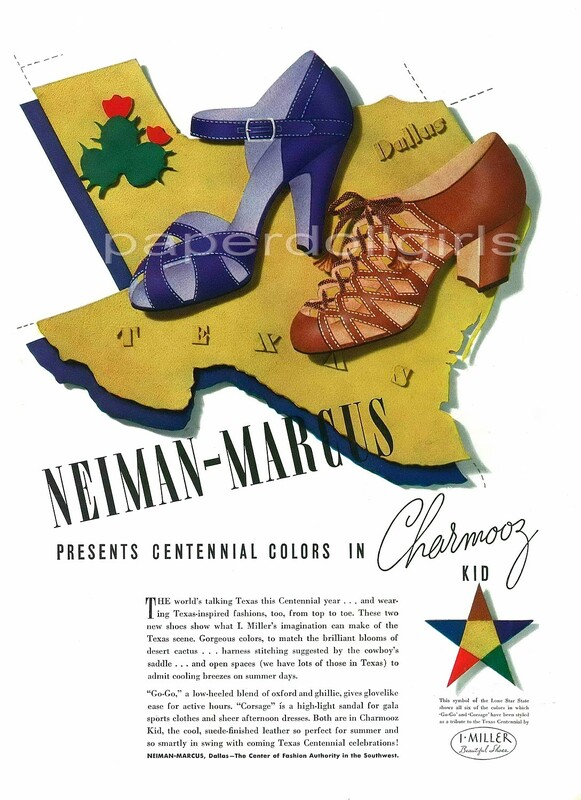 Below, text from a Neiman-Marcus ad which appeared on the eve of the huge Texas Centennial celebrations in 1936. Five days before the Centennial finds Neiman-Marcus keyed for last-minute demands … both in selections and service … Spectator clothes and accessories in cactus colors (see current Vogue), and Artcraft stockings, thin as a web, in Texas range colors … Cool snowy crepe dresses for the afternoon and printed chiffon jacket dresses for Centennial sightseeing … Cottons gifted with importance … Crownless roof hats and trailing garden party dresses … Cattlebrands burned on a rawhide belt that girdles a crisp white watching dress. All in the best of taste and at a happy range of prices. And then I looked for the Vogue ads mentioned and … wow! I’ve had a vintage advertising blog for several years, and I’ve seen a lot of ads … but these may be my favorites! All as a tie-in to the Texas Centennial, celebrated in Dallas in 1936, spear-headed by Stanley Marcus himself. Thanks, Mr. Stanley! 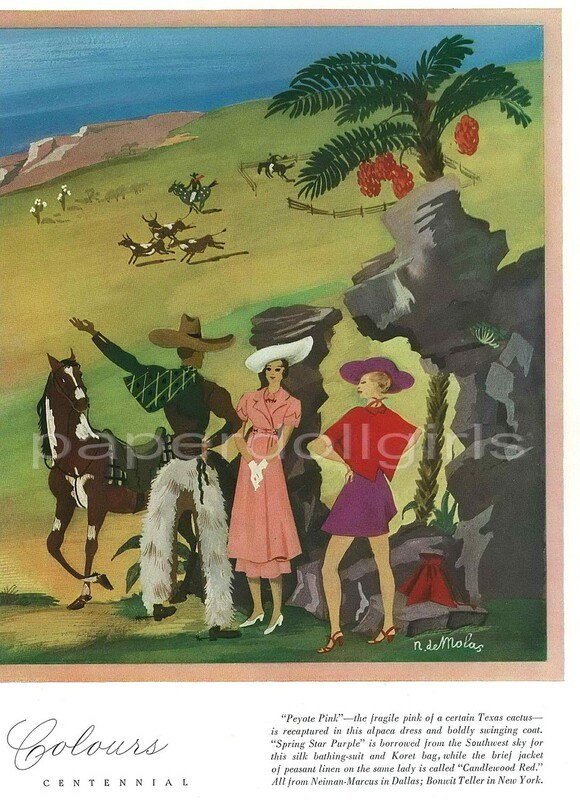 Color ads from Vogue, June 1936. I found them on Etsy from this seller (the ads have, apparently, been sold). I would LOVE to see these with the watermarks removed, and I’d also love to know what became of the original artwork and who “N. de Molas” was. 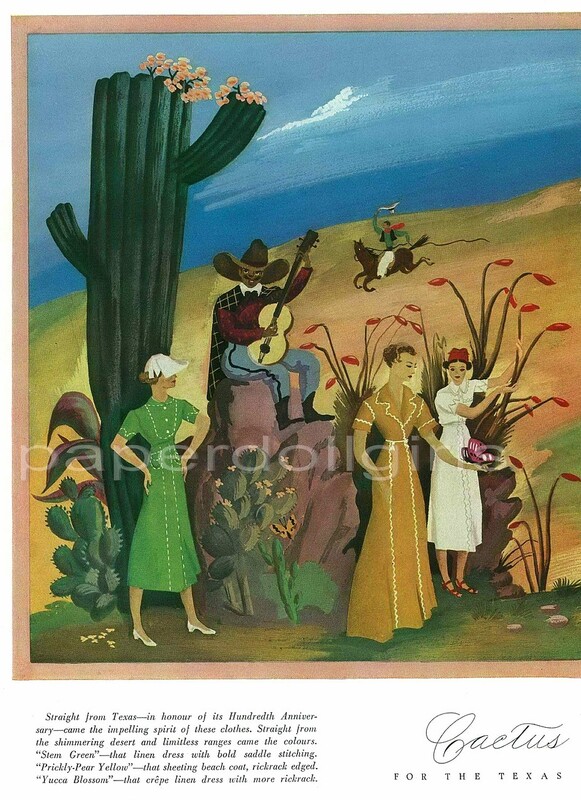 I love Texas kitsch and I love fashion illustration from this period, and this is fantastic! Click color pictures for much larger images! And read that copy, man. If you want to wander around a whole bunch of vintage advertising, my Retro Adverto blog is here, but it has been sadly neglected since my immersion into this blog! 1907 – 2002; c. 320 cu. ft.
Dallas, Texas, department store. Correspondence relating to store public relations; Green House; Zodiac Room; files from Fortnight and Christmas promotions; direct mail advertising; original art for advertising; newspaper advertising; photographs; audio/visual cassettes; scrapbooks; Marcus family history relating to the store. Collected for the store’s 75th anniversary.